Any lingering notion that frogs are cute little animals that are only a threat to flies must surely be laid to rest. 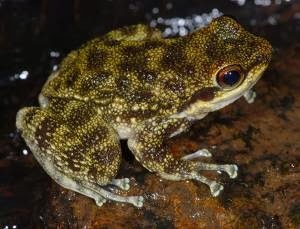 The Emei moustache toad has a weaponised moustacheMovie Camera, used to gore rivals, and one African species can break its own toe bones to make claws. To this intimidating list we now add a sabre-toothed frog. This beast is equipped with a pair of powerful fangs, and gets at least some of its food by munching on other frogs. It sounds like an oddity, and the latest evidence suggests that it really is. This fanged frog belongs to a previously unknown family of frogs, genetically different from all others. Nowadays such discoveries are extremely rare.